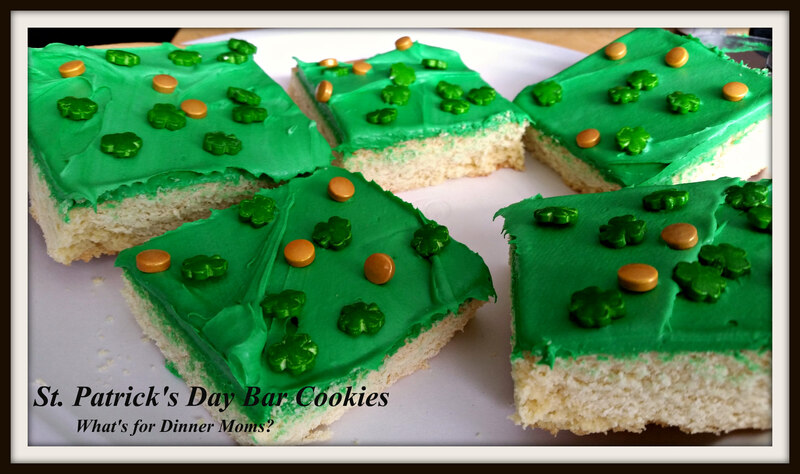 St. Patrick’s Day Bar Cookies – What's for Dinner Moms? My children are slightly older (13 and 16 years-old) but they still love to celebrate all the holidays. No holiday can go by without decorations, special food, or talk about our past celebrations. I love these cookies. They are so very easy to make and are so fun. You can change them with the holidays by changing icing colors and sprinkles. Speaking of icing colors and sprinkles my favorite colors are the Wilton paste colors. They are so vibrant and give such beautiful colors. I find the liquid colors are great for pastels but I wanted a vibrant Kelly green so I used the Wilton* colors. I also found these great sprinkles from Wilton at Michael’s. Aren’t they cute? Saint Patrick’s Day is second only to Christmas in our house. The Irish flag is hung, there are shamrocks on the doors and a little leprechaun in our window. Soon the corned beef and cabbage will be cooking. But, until then these cookies will help tide them over. The cookies are super soft. Both children said they reminded them of a softer shortbread cookie. They of course loved the green frosting (you can color it however you like or not at all) and the cute little sprinkles. Preheat oven to 375 degrees. Prepare an 11″ x 14″ rimmed baking sheet by covering with parchment paper. Beat butter and sugar together until light and fluffy. Beat in vanilla and eggs until well combined. Add dry ingredients and blend until well mixed. Dough will be stiff but use your hands if needed to mix at the end. Pat dough into baking sheet. It will fill the entire sheet. Bake cookies for 10-12 minutes. Do not over bake or cookies will be crunchy on the outside and dry. They will be slightly golden on top but set in the center. Once cookie has completely cooled make frosting by beating butter, vanilla and sugar together. Add cream as needed to thin mixture. Add food coloring as you wish and frost. Great idea. I love the green icing and the little clovers. Thank you! My kids love these cookies. Great! Glad you liked them. Haha! Thank you! At least I know one person read the post. That’s what happens when you do it from memory because it is so automatic in your head to just do it. LOL I know I always re-read posts of mine-easy to happen Marci! Wow! I went three years without a,microwave and my children thought they were deprived. I would deal but that would be difficult to go 5 months without an oven. Did you at least have the cook top? 3 years without a microwave is a while! Yes, our stove top burners worked and I used crock pots A LOT! 😊😊 The heating element went out in the oven and it was an extra $100 we just didn’t have for a while. Now we are baking fools! Ha ha! What fun cookies! I’m sure the kids have been gobbling them up! Thank you! Yes, my son asked me to put them away the other day after I took pictures because he kept sneaking nibbles. I just got my corned beef tonight at the store. I have everything else. I need to get out my shamrock pans. The cookies look good. Thanks for sharing. I was just mentioning I need to go pick up 5 or 6 corned beef briskets. Love, love, love my corned beef. Can’t wait to make these! We love St. Patrick’s Day. Thanks! Yum! Those look so good… love the little clover sprinkle things. Where did you find those? They are Wilton sprinkles. They were purchased at Michael’s in their baking aisle. Pingback: Spring Sugar Cookie Bars – What's for Dinner Moms?